Just a very quick NOTD post for you guys today. Since coming back from my trip I haven't been doing my nails much as my cuticles have been really ragged and they just look terrible *cries*. I guess the change from HK humidity to cold Sydney Autumn didn't help! You won't be seeing many manicures on my blog until they recover unfortunately but I have some other exciting posts for you don't worry ;) I decided to do a quick mani the other day and I finally tried out OPI Teenage Dream with some Black Shatter magic. Excuse my pics in this post - a light bulb went out in my room JUST before I finished my mani hence dodgy lighting. Teenage Dream is a gorgeous pink glitter polish from OPI's Katy Perry collection. I wasn't really all that fussed about the collection when it first came out until I saw swatches of Teenage Dream and it sold me. I had to get it for myself! There's all sorts of wonderful glitter in it and for a glitter lover like me it's a wonderful pink with lots of sparkle for my collection. It's quite a sheer polish but as I was going to apply Black Shatter over the top I only went with 2 coats which is pictured below. I then applied a thin coat of Black Shatter over the top and WOW! What a combination. My pics don't do this manicure justice but believe me it looked awesome! I couldn't stop admiring my nails and the girls at work loved it! I had to bring these polishes in to work and do the same combination for them too haha. What polishes have you fallen in love with after seeing swatches online? I do my patient's nails sometimes, they LOVE it. So pretty, i really want the shatter polish!! Soo pretty. I really love it! This looks fantastic! The possibilities are endless when it comes to shatter! Ohh, it looks so pretty...I always thought that I don't want this duo....but your photos made me change my mind, I think! Great mani Chelle I really should get on this shatter wagon! i haven't been a lover of the shatter polish but black is a one that i wouldn't mind having. But i think you sold me on a combo that i would love, Very nice mani i can see why the gals at work want it too. 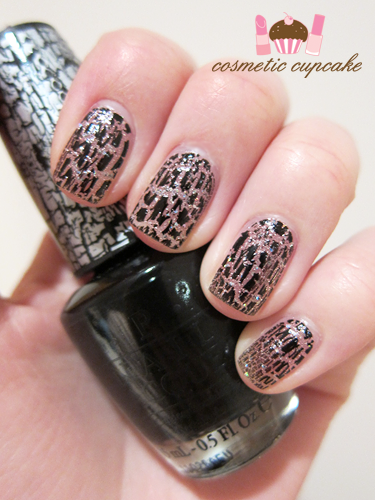 I love the way you get your black shatter to crackle! I've seen a lot that are too chunky. love this combination so much! i may have to paint this once my nails look a bit better! The black shatter makes teenage dream a lot tougher, I like it!